Dizziness can often occur with other symptoms like headaches and neck pain. Though these symptoms can be related, for this article, we will examine the symptom of dizziness, especially dizziness that occurs upon standing. 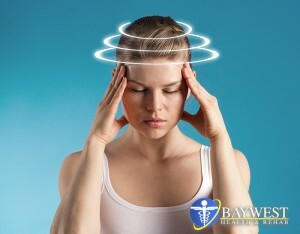 How does dizziness relate to neck pain and headaches? Feeling light headed or dizzy when you’ve just moved from a position of lying down or standing is not unusual, especially if you have changed position very quickly. The medical name for this feeling of dizziness following a change in posture is orthostatic hypotension (OH). It’s often thought of as harmless, but the latest research suggests that it may be more serious than previously known. Let’s take a look at what occurs with our blood pressure whenwe move from lying down to standing. Lying down is easier on our heart than standing up, so when we are lying in bed, our blood pressure is generally at its lowest. Standing requires our hearts to work harder. When we move from lying in bed to standing up, such as when waking up in the morning, blood will pool in our lower legs at first for a few minutes, until our body responds to our change in position by naturally increasing our blood pressure to deliver more oxygen to our brains. This mechanism works to prevent dizziness. In some people, the mechanism described above doesn’t work so well. Orthostatic hypotension (OH) is suspectedwhen one’s systolic blood pressure drops more than 20 points after changing posture, such as from lying to standing. The systolic number of a blood pressure reading is the top number, measured when the heart contracts). It can also be diagnosed if one experiences a drop of 10 points in the diastolic blood pressure reading when changing position. The diastolic number of a blood pressure reading is the lower number, measured when the heart is relaxed. Sometimes, one can experience a drop in both systolic and diastolic numbers. OH most often occurs after a change in posture and can happen immediately or within approximately three minutes. Orthostatic hypotension (OH) has two main types. The first and least serious is called delayed orthostatic hypotension. With this type, patients do not usually experience any symptoms immediately; symptoms usually begin three minutes or so after standing. The next type of orthostatic hypotension is known as full orthostatic hypotension (OH). This is the more serious type, and symptoms begin as soon as the patient stands from a sitting or lying position. A recent study published in Neurology in 2016 reviewed medical records of a group of 165 individuals who had been examined at a specialist center after experiencing dizziness. The subjects had an average age of 59. 48 subjects in the study had delayed orthostatic hypotension (DOH), and 42 participants were diagnosed with orthostatic hypotension (OH). A control group consisted of 75 subjects who didn’t have either condition. During 10 years of follow-up throughout the study,54% of study participants with DOH developed OH. Of those, 31% went on to develop Parkinson’s or another neurological condition. Diabetes seemed to increase one’s risk of developing OH. Diabetic patients in the study who initially had DOH were more likely to develop OH than study participants who did not have diabetes. Out of a total of 165 study participants, 29% of those diagnosed with DOH suffered an early death; this figure rose to 64% for those with with full OH. The death rate for the control group (those without DOH or OH) was 9%. The study authors hypothesized that blood pressure treatment for study participants with DOH likely prevented most of them from developing full-blown OH. The authors concluded that early diagnosis and treatment of both DOH and OH was especially important in preventing early death. They acknowledge that this particular study was limited, since it only analyzed medical records of those who had tests at a specialized center. Thus, further studies are important, as this particular study’s findings cannot be extrapolated to the general population. Despite the need for additional studies, this study is extremely valuable to the medical community and to patients. This study marks the first time that OH and DOH have been described as potentially serious conditions that merit close monitoring and investigation. It challenges doctors and patients to not dismiss these conditions, but to do full evaluations and follow-ups. This research is especially important, since OH and DOH are both very common conditions. As this study demonstrates, both of these illnesses deserve more attention from health care professionals.